I have been very remiss with blogging our daily adventures lately. Yet it does not bother me as I know many of you follow me on Instagram to see the pics of our day to day life (@ceelew). The fact I haven't had the time to devote to reflecting on our activities in a more verbal way is evidence of the extent to which we have been simply delving into life and living. My baby is three years now so the level of independence in our home is increasing and I wonder where that will lead. For now I am compelled to share with you these fabulous videos we have been watching as part of our education in our home. Come for a ride with us as I attempt to place all videos on here. Learn about India and about how you may be able to support the growth of young people in that country. Coconut Rice Bubble Crisps made by my Ess last week. Last week Ess made us these delicious biscuits almost entirely independently, as well as transforming the recipe. I'm so proud of her. A few people saw them on Instagram and have requested the recipe so I thought I'd share in this long quiet place. I hope that you may enjoy these too if you happen to stumble by here. These are a childhood favourite of mine, baked often by my mother's friend, Bet Harborne. 1 cup coconut (I think. My copy of the recipe actually doesn't state the amount so feel free to vary). Cream butter and sugar, add egg. Beat well then add vanilla, coconut, then sifted flour. Roll teaspoonsful in rice bubbles. Baked on a greased tray in a moderate oven (180°C) for 10 minutes or until golden. Store in an air-tight container and they will remain lovely and crisp. Suitable to freeze. * We used some brown sugar as I'm slowly replacing all our sugar with glucose or dextrose and there's only a little brown sugar left. * We had run out of eggs so Ess simply left it out and moistened the dough with some milk as it needed it after adding the flour. * We use spelt flour rather than pure wheat flour and I often raise it with ¼tsp bicarb soda and ½tsp cream of tartar per one cup of flour. Ess missed this raising step, yet still created yummy bikkies. * We didn't have any sultanas as we don't use dried fruit due to their excessively high levels of fructose, so they were omitted. * Our rice bubbles were not the usual variety but rather they are called Gluten Free Rice Bubbles. We love their crispiness and their round shape. They are very very popular, especially with my two year old. We buy them here at The Nut Shoppe. We enjoyed our bikkies so much that when I restock the cupboards with glucose and eggs we will give them another try and perhaps the cakey part of them will be even crispier. I'm not an historian but I can get interested - obsessively interested - with any aspect of the past, whether it's palaeontology or archaeology or the very recent past. It was a day of tremendous organisation by one of our members with assistance from only one other. All her organisation and planning, resource sourcing and creativity is to be applauded. The children had a fabulous time learning about what archaeology is by viewing a mockup scenario (a cow skeleton in a box of dirt) displaying what an archaeologist would do by stringing off the area of 'the dig' to form a grid pattern which they would then work through square by square. The spine of the cow contained therein was then plastered by the children in order to have it keep its shape when removed. They were given a demo on how to sift through portions of soil by scraping across the top of the soil and sifting it while observing and looking for their "finds". This was then put into practice by sifting through sand and clay, exploring and discovering. Ess is carrying out this technique below. I just loved these sieves and trowels which were made for the occasion and each child had one each. No fussing or fighting or waiting. Each could busily sort through their own box of dirt. The sifting and sorting and "digging" provided no end of discoveries for each and every one of the children from the youngest to the eldest. There seemed no end to their "archaeological finds". Here Ess proudly displays her quartz find. Teeth and coins as well! We are still primarily eating no sugar and enjoying the changes it has made to feelings of satiety after each healthy meal we consume as well as being free from the cravings of sugar so often felt in the past. I enjoy the way I eat so much now that I rarely desire to eat cakes or biscuits, or sweets of any type. The children of course continue to request lollies as we near birthdays and ice creams as the weather warms, but their consumption of sweets is greatly reduced. I do slip, just now I ate a Cadbury Rose which my neighbour delivered to us as a thankyou gift for collecting their mail while they travelled. However we largely don't eat store-bought treats in our home. 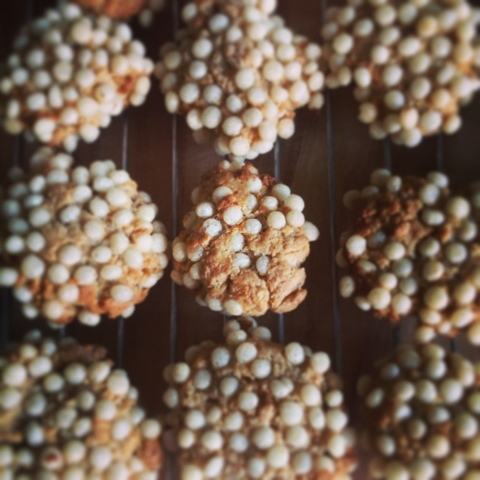 When we do want something different the following biscuit recipe is one I've devised which still has the children coming back for more....and more....and more. It's delicious and I hope you enjoy this. With the sugar out of the equation I find that the flavours of the spices and orange zest, and almonds as well, are much more pronounced. It's interesting how our palate changes along with the foods we consume. Cream 200g butter with ½ cup glucose being careful not to beat too long with the glucose as it goes hard. Add 1 egg and the zest of one orange. Beat in ½-¾ cup spelt flour. Add 1-2 tsps ginger and cinnamon and 1 tsp cocoa. Continue beating in almond meal to make a stiff dough - perhaps up to a cup, or more. My little Eee has turned five. The cake required for the birthday was quite a simple trampoline. I was very grateful for this as I was unwell for most of August. Getting my head around a more complex cake was not what I needed as I recovered from persistence congestion and coughing. I have always included my girls in cake decorating for their birthdays rather than keeping the cake a surprise for them. For this also I am grateful as it means that they set to work in decorating for themselves while I simply supervise. They are also learning valuable skills as well as setting their creative minds and fingers to work. And with the addition of a few sweet little dollies the trampoline comes alive. God's wonderful work surely shows. This is the view my eyes beheld as I opened my lounge room curtains on Saturday morning. Beautiful isn't it! A dusting of snow on the Brindabellas. however we didn't see it. It was raining for us here. we enjoyed a quick lunch and headed to the hills. We didn't have to drive too far before we arrived at snow along the closed Corin Road. We stopped at the gate and proceeded to walk and throw snowballs, build snowmen, make snow angels etc. I do so very much miss the beaches we enjoyed closeby in Adelaide. However the snow seems to hold a similar amount of fun for everyone! Just wish it happened more often.